If you add the Save & Finish Later extension to your form, you must also add a Finish Later action, either to a button or a link. Next, on the button/link, you edit the Actions property and choose one of these two Finish Later actions. Then, when the user clicks the button/link, their form data is saved and they can return to the form later. Note: The second option will not work if the Finish Later Settings are using Direct Link to Resume Settings Mode. Create a button or a link. In the Field General Settings properties panel, click Actions. In the New Action Settings window, click New. From the dropdown menu, choose either of the Finish Later actions from the drop-down menu and click Next. 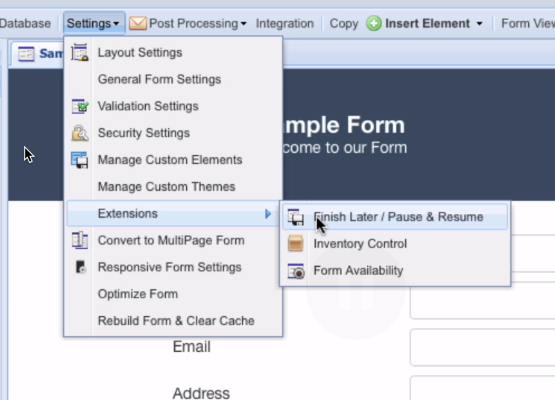 Click Save to return to the Form Designer. Preview your form to test the action. When your user launches this form and clicks the Save button you created, a pop-up window will appear that prompts them to enter a username and password. Upon return to the form, the user must enter the username and password to retrieve their saved data. To change the order in which actions run, click an action name in the Actions window and moveup or movedown until the action is in the position you want. Repeat this for any actions until they are in the order you want them to be. To delete an action, click the action name in the Actions window and the click Delete in the toolbar.